I often get asked about our name: The Poetry Box. Where did it come from? What does it mean? When I was growing up in the midwest, I had a fascination with little gift boxes. I collected pretty boxes and kept them in my dresser drawer. Each box held its own treasure—anything from marbles, wheat pennies, fancy buttons, wishing stones, love notes, horoscopes, seashells, sequins, my mom’s discarded lipsticks, and short poems I would tear out of my grandmother’s Reader Digest each month. When Robert and I first met, he was teaching professional photographic workshops under a “Photo Box” moniker and also used the name “Portrait Photo Boxes” for his portraiture business. So when I approached him about combining his photography with my poetry to create custom gifts, he suggested the name, “The Poetry Box.” Remembering my dresser drawer full of little boxes, I knew it was the perfect name and, the rest is history. 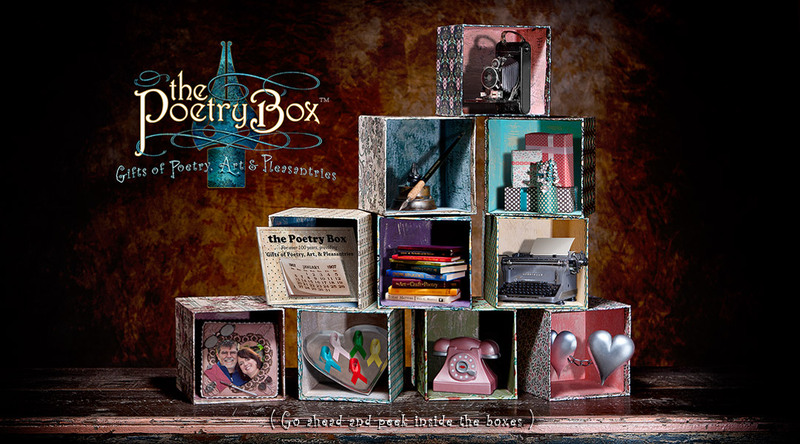 The Poetry Box® is a federally registered trademark for publishing books & literary journals, custom artwork, greeting cards & gift items and hosting book launches & poetry readings. When we decided to publish an anthology of poems about birds, it was partly because I actually had a lifelong fear of birds. And in order to overcome a phobia, it’s usually suggested to face it head-on. Well, I wasn’t quite ready to visit the aviary, so instead, I solicited submissions of beautiful poems and stories about our fine-feathered friends. All we needed was a clever name for our new book idea. One afternoon, I started a list of different birds species. Cardinal, bluebird, robin, woodpecker, crow, raven, penguin, parrot … pigeon, carrier pigeon, homing pigeon…EUREKA! That’s it. We’ll change homing to poeming and call our book Poeming Pigeons. Robert and I both loved the name. Robert got to work right away sketching what would eventually become Homer, the poeming pigeon. We dressed him up with aviator goggles, pinned a “Birditzer” literary-award on his chest, stuck a book of poetry under one wing and an antique writing pen under the other. Homer was ready to deliver poems across the globe! 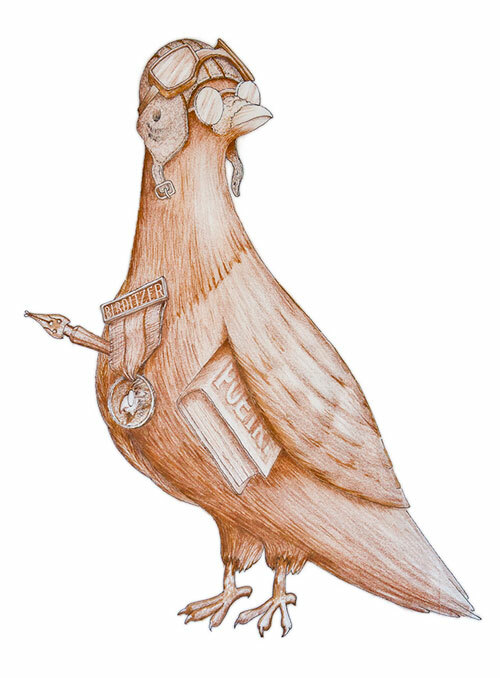 We were overwhelmed by the number of submissions and the success of Poeming Pigeons, so we decided to modify the name to The Poeming Pigeon: A Literary Journal of Poetry. We decided each book would have a unique theme, and Robert would illustrate Homer with a new chapeau and various props to correspond with each issue’s theme. And just in case you’re wondering about my bird phobia. Living in Portland has had quite a positive effect on me as I was captivated by its natural beauty and seasonal surprises. One of those surprises was a nest of dark-eyed juncos in our backyard. With the birth of those adorable little birds and our new literary journal, I have completely overcome a fear that lasted 50 years. I feed our backyard birds daily and hope someday to feed those little juncos and chickadees from the palm of my hand. 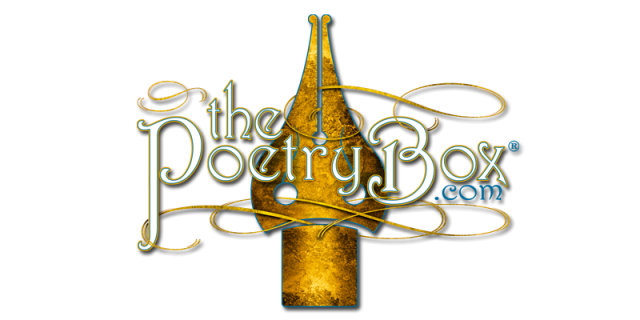 The Poeming Pigeon® is a federally registered trademark for published books, anthologies & literary journals, namely poetry, short stories and imagery.